India’s comatose food tech space was jolted awake yesterday when Ola announced that it was acquiring Foodpanda. Food tech had had a miserable couple of years in India, with firings, shutdowns, and even a founder being held hostage by irate employees. There had been signs that the sector had been recovering throughout 2017, but Ola’s Foodpanda acquisition seals the deal — food tech is well on its way to recovery in India. Here are 6 things that will change as a result of what might be the most significant deal in India’s startup ecosystem in 2017. 1.Food tech is hot again: There had been indications that things were improving in the sector. Zomato, Swiggy, and Foodpanda had all increased revenues this year while decreasing their losses, and Swiggy also raised a Rs. 515 crore Series E round. Ola putting in big money into the sector — apart from the stock deal, it’s committed to investing $200 million (Rs. 1350 crore) into Foodpanda — shows even companies and VCs believe that a turnaround is around the corner. This enthusiasm could lead to more players once again attempting to crack the once-elusive market. 2. Ola has chosen wisely: Of the three major food tech companies in the space, Foodpanda might’ve been the smallest, but it was also the most efficient. While Zomato lost Rs. 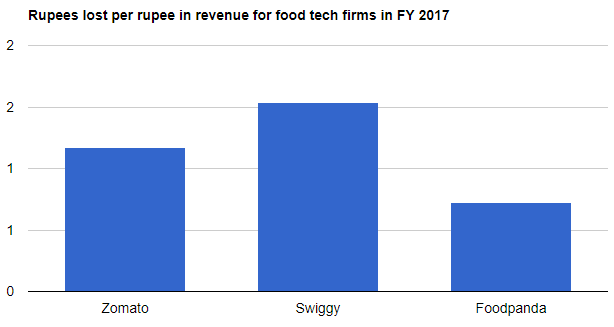 1.17 on every rupee it earned in FY 2017, Swiggy lost Rs. 1.54. In comparison, Foodpanda only lost Rs. 0.72 on every rupee it earned in 2017. If Ola can add its financial and logistical might to this already nimble food operation, it might end up creating a very powerful food tech player. 3. Zomato and Swiggy will sweat: Zomato and Swiggy had settled into comfortable Number 1-Number 2 positions in 2017, but Foodpanda now has the firepower to challenge them both. The food tech space is once again a three-way race, and Zomato and Swiggy could see depressed margins as Foodpanda tries to wrestle its way to the top spot. 4. Customers can rejoice: While Zomato and Swiggy might see depressed margins, customers will have no such reason to worry. With the $200 million investment that Ola is putting into Foodpanda, the discounts that had marked the coming of the food tech boom in 2015 might just return. If Foodpanda starts offering cheaper prices, Zomato and Foodpanda might be forced to follow suit, leading to lower delivery prices and more discounts across the sector. 5. Uber-Ola rivalry intensifies: Ola might not have the financial might of Uber, but its Foodpanda acquisition shows that it’s not backing down from a challenge. Ola has not only matched Uber step for step, but it’s outpaced its global competitor on occasion — Ola now has a much bigger mobility portfolio in India than Uber, with options for shuttles and cycles, and even has an in-car entertainment platform called Ola Play. With its Foodpanda acquisition, Ola now has its own answer to UberEats, thus chipping away at the last major advantage that Uber had. 6. An Ola-Uber merger looks less likely: Ola’s Foodpanda acquisition shows it’s in it for the long haul. 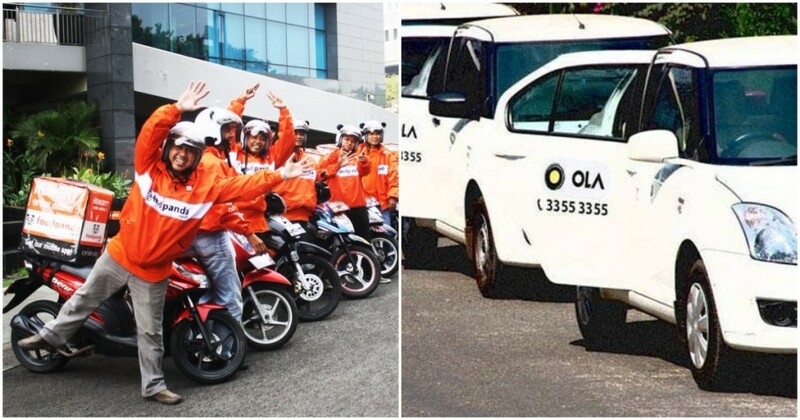 With Foodpanda in tow, Ola becomes a much less likely merger or acquisition candidate for Uber. Both companies now have a major player in the food delivery space, and combining forces would yield an unwieldy combination across food tech and ride hailing. With Ola and Uber now having very similar portfolios, there are fewer synergies to extract from a merger, making a coming together less likely.